'Ta Yebka El Khadar Enna' corporate campaign reflects INDEVCO’s commitment to the community and the environment. INDEVCO has launched Ta Yebka El Khadar Enna campaign to support the Lebanese Ministry of Interior’s initiative to upgrade the Civil Defense (Difaa El Madani) Fire Department with new equipment and materials. Translated roughly as ‘So the Green Remains’, the campaign seeks, first, to collect 10,000LL (approximately $6.65) or more from each employee who would like to participate and, second, for each INDEVCO affiliate to match its employee donations, lira for lira. Call your accounting manager with your contribution! 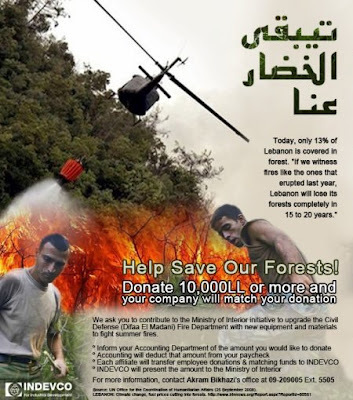 Forest fires consume an average of 1500 hectares of Lebanon's forests annually. However, with the rise in temperatures, the drying of forest soil and trees is leading to desertification, resulting in earlier and more fires. The devastation of 2007 prompted a turning point towards a proactive national strategy. In the aftermath, the government established the National Committee to Combat Forest Fires & Restoration of Lands, which involves major ministries and the AFDC. Association for Forests, Development & Conservation (AFDC). (December 2008). For Nature, For Life Quarterly Newsletter.